so each year I make the trip to Indianapolis August to attend GenCon. 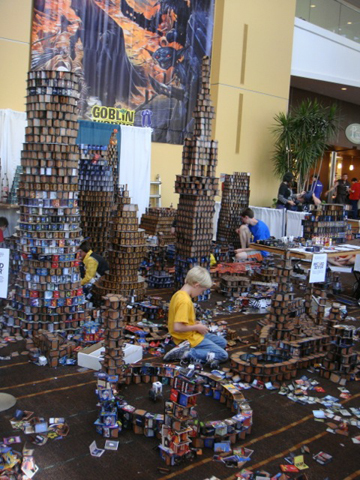 GenCon is a four-day (plus with extra stuff the various gamer groups plan) convention where people play every imaginable type of game. Gaming goes on 24 hours a day in the Indy convention center and various hotels and bars in Indy. There is something for every type of gamer, with tournaments and casual play in all kinds of games. There is a massive exhibit hall where game companies come to demo their new games, preview stuff that is not quite ready, and give out swag. Oh, how gamers love swag. There is a costume event, a zombie walk, and other special events. Movies and anime are shown throughout the con, too. 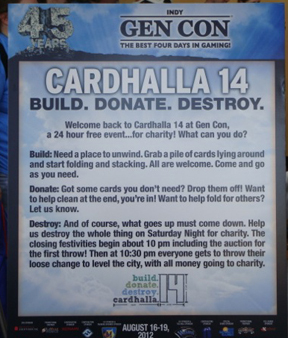 One of my favorite events to attend each year is the destruction of Cardhalla. Cardhalla is where old ccg (collectible card games) cards go to die an honorable death. 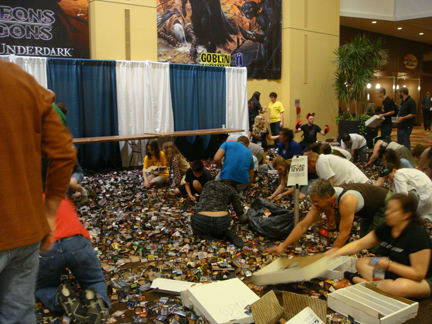 Boxes and boxes of extra common cards and cards from dead ccgs are gathered by the Cardhalla organizers. 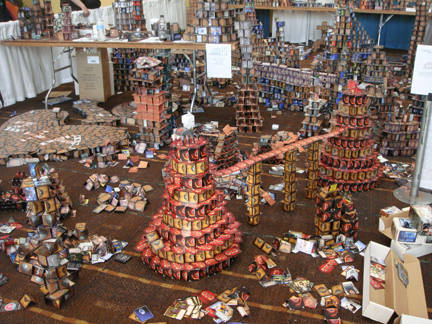 Then gamers of all sorts build card houses, card towers, card bridges, and in the end it becomes a massive card city. People start building on the opening day of the con, and many work until the wee hours on their structures. I have seen marvelous structures done with love and great imagination. I have seen a working waterworks built prior to the convention that two guys put over 150 hours into building, and saw it actually run. Everyone is welcome to join in on the fun, and young and old alike will sit and build. 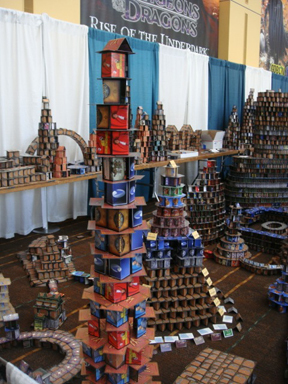 Since these structures are built by gamers, some of them are quite tricky and built solidly with internal support structures. Cards are folded, stacked, and sometimes slotted into each other. Some of the towers reach remarkable heights, and the bridges span surprising distances. I usually stop by throughout the con to see the progress and the fun. It’s remarkable to see it grow. A security service watches over it in the night periods to make sure no one messes with Cardhalla before the designated destruction time. It is sad to report that it must be destroyed, that it cannot remain. However, the destruction itself is far from sad; it is quite gleeful. 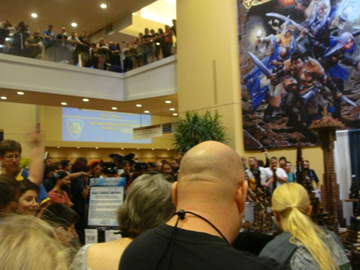 GenCon has a designated charity each year, and various events throughout the con raise funds. Cardhalla is one of these. On Saturday evening, people gather to throw coins at it, to bring it down. The auctioneer from the games auction event presides and auctions off the first coin toss. This is a fun thing, because people will start pooling funds from friends, strangers, anyone nearby, who can toss them a couple of bucks. In the end, there is one or sometimes two individuals who raise big bucks for that first toss. This year, two bidders competed with people around them passing funds (or from the balcony above!) to add to their totals. Between them, the two people raised $1652 for the privilege of the first coin toss. Then, the countdown begins for the first toss(es). This year one of the winners actually took down a tall tower with her toss. It was impressive. After the first toss, the organizer give the rules, and a new countdown begins. And then, MAYHEM AND GLEE! 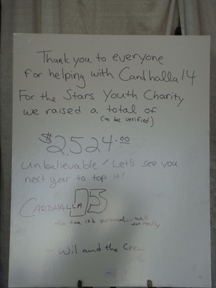 Everyone throws coins to destroy Cardhalla. Some of the buildings and towers come down easily, others are incredibly resilient, coin after coin barely denting them, because stacks of cards are inside, holding them up. Once everyone has thrown all the coins, volunteers help clean up the cars and collect the money. It is so much fun to throw coins at the towers. I’m not sure why, and I don’t care. I just know that every time I attend GenCon, I make time for the destruction of Cardhalla! I’ve heard about this for many years…..glad to read about it!